This book reflects current developments in the economics of agrobiodiversity and focuses its attention on the role agrobiodiversity can have for economic development. As a new and rapidly expanding subfield at the interface of environmental/ecological, agricultural and development economics, the editors and contributors to this volume provide a thorough, structured and authoritative coverage of this field. Topics covered include the economic modelling of agrobiodiversity, policy and governance solutions for the conservation of biodiversity in agricultural landscapes, contracts, markets and valuation. 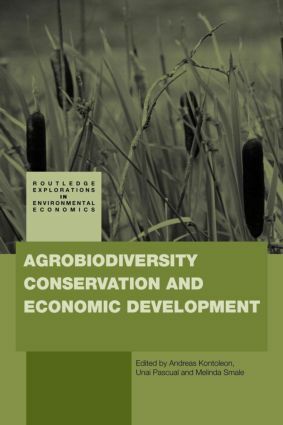 The authors include well-known and respected academics and researchers who have a real policy perspective into the role of agrobiodiversity and economic development. The book provides coherent and up to date coverage of the economics of in-situ agrobiodiversity conservation which is to a large extent currently absent. Though the material in the volume is primarily written for economists, its content and style are highly relevant and accessible to ecologists and conservation biologists, and to academics from other broad disciplines that are located within the areas of economics and ecology. Introduction: Agrobiodiversity for economic development: what do we know? Do we have an adequate global strategy for securing the biodiversity of major food crops? Agrobiodiversity in poor countries: Price premiums deemed to miss multifaceted targets?